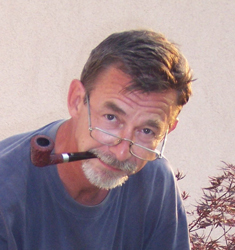 Although his age would make him part of the older generation, Michal Novák belongs to the generation of Czech pipemakers that have won recognition in the last decade. He had a close contact with pipes all his life, mainly as a passionate pipe smoker but also with his former profession. For years he worked as a journalist, photographer and later on as the editor in chief of the “CigarΠpe” magazine. For 12 years he has been the Czech member of the Academie de la pipe. The shift that brought him into the pipemaking craft was his visit to the pipe studio of Jan Klouček where during a workshop he manufactured his first pipe. After some time he gathered more and more skill and became a fully-fledged member of this pipe studio and a professional pipemaker. His pipes are well accepted by pipe enthusiasts all around the world because after the first ones that had mainly classical shapes he started to enriches the range of shapes with modifications of his own. Always keeping in mind all his experience as a pipe smoker, he still has the courage to try new forms and shapes. For example pipes with asymmetrical shapes that fit the hand for a better hold. Michal himself prefers variations of pipes with flat pipe bowls and an oval tobacco chamber, actually within the pipes that he smokes several of these can be seen. His pipes can be recognized by a camera logo with the initials MN in the lens.